Midisaurus Music is an award-winning interactive music program designed to support the teaching and learning of music for young learners. 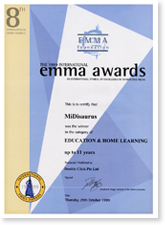 Midisaurus Music makes classroom or home-based music learning an enriching and engaging experience. MiDisaurus Music develops real music skills, the understanding of music in relation to history and culture, and fosters the ability to be musically creative. An edutainment approach holds the child's interest with colorful animation, fun-filled games, songs and activities. Expanded contents include solfege training, a large selection of keyboard pieces and guided composition. Midisaurus Music is developed by Town4kids, a leading developer of music education courseware for schools. In collaboration with London College of Music Examinations, the program also integrates theory assessment and pre-grade theory examination for young beginners. London College of Music is the largest specialist music and performing arts institutions in the UK. The college was founded in 1887 as an establishment devoted to music education. In 1991 it became part of University of West London, one of the largest universities in the UK, spread across three campuses.The music college has unrivaled facilities in the heart of London's music and media business district. Its curriculum embraces innovations and advances, creating one of the country's most prestigious and sought-after degrees in Performing Arts and Music Technology. London College of Music Examinations (LCME) is the only external music examinations board affiliated to a university in the UK. External examinations have been awarded by the college since the institution's founding in 1887. Today, external examinations are held in learning centers, institutions and music schools all over the world in Europe, Asia, Middle East and America. The range of syllabuses and examination formats are exceptionally wide, covering performing arts, music and drama, from pre-grade to diploma levels. LCME's graded examinations in most subjects are accredited by the QCA (Qualifications and Curriculum Authority), which serves as a UK governmental stamp of approval and quality assurance, confirming parity of standards with other similar examination boards. Candidates applying to UK universities through the UCAS system can increase their points tariff if they have been awarded a Pass or higher at Grades 6-8 levels and onwards. LCM Examinations are distinctive, both in the qualifications offered and in the administration and running of the examinations. The examinations are set in a fully professional and modern context, while retaining the well-known traditional atmosphere and qualities of London College of Music: informality, friendliness and approachability. LCME's examiners are highly qualified professionals, applying thorough and objective assessment criteria during examinations. For more information about London College of Music Examinations, visit LCM Exams.